Why C64: A Visual Commpendium by Sam Dyer Matters – Obi-Wandi, a retrogaming retrographer. The visual make-up of objects attracts attention. The mind is jolted into activation by sensory impulses and forms an opinion on the quality of the visual trigger. The world of computer sciences had for a long time been ailing as an obscure, even time-wasting art. Computing was indeed difficult to grasp during its formative years and even harder to explain; there was no visual impulse as, for example, the instantly perceptible majesty of Sir Christopher Wren’s St. Paul’s Cathedral in London, which lends credence to the art of architecture. The computers and their operators responsible for Neil Armstrong’s, Buzz Aldrin’s and Michael Collins’s safe trip to the moon clearly were not part of the 1969 parade in New York. Computer and video gaming predictably struggled to an even greater degree. Computer and video games started out in the simplest of manners. Dots flitting about a flickering screen further underscored the nuisance that computing was perceived as. There nevertheless proved to be a growing number people capable of looking beyond the infant state electronic games were in to realize the unlimited potential of willing visuals onto a computer display by entering well-planned user commands. Perseverence and financial success eventually saw the development of a fledgling, seemingly useless looking industry through. And it was Sam Dyer who preserved the exciting underdog story of a monochrome pixel that journeyed to 8-bit multi-colour graphics to become the sensation it would be recognized as on the Commodore 64, the most popular home computer ever. A canvas for a new breed of digital artists: Commodore C64, released in 1982, the most successful home computer of all time. It displayed a sensational palette of 16 colours, which were fully accessible through its “multi-colour mode” displaying 160×200 pixels. The low resolution and the new computing technology altogether proved a challenge to both programmers and designers, but not an insurmountable one. Sam Dyer expertly captures an evolution that saw computer skills branch out into the areas of design and animation. His Visual Commpendium is an impressive display of how human ingenuity unlocked the potential of a technology not yet universally understood. Thousands of individuals spent tens of thousands of hours coaxing visual output from a beige plastic case stuffed with electronics, its rainbow-coloured manufacturer logo staring at the toiling would-be coder in silent mockery. Many excellent and highly recommendable books cover the history of video games and the platforms they appeared on. They contain stories on the legal, financial and corporate aspects of the computer and video gaming industry, but none has ever charted the emergence of game design as vividly as Sam Dyer. Commodore 64: A Visual Commpendium: A mysterious package from Sam Dyer arrives one day at an Austrian doorstep. Sam allows the readers’ minds to ease into the arguably abstract world of pixels that speak for themselves. Said pixels gain in complexity with every turn of a page. Definition clarifies as shapes evolve into recognizable characters. Worlds finally emerge from barren, monochrome backdrops, shading techniques begin to add perspective and plasticity. 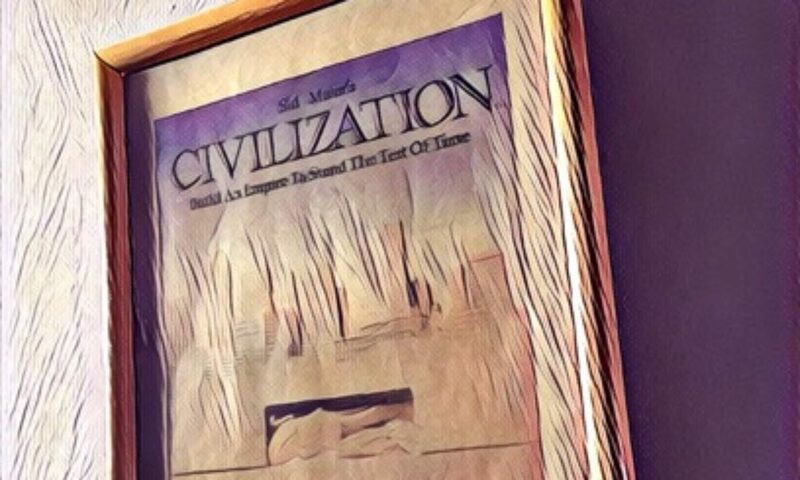 Thumbing through Commodore 64: A Visual Commpendium consequently equals a time-lapse sequence of technological and human progress. The clean simplicity of 8-bit computer graphics. Detail of Commodore 64: A Visual Commpendium by Sam Dyer: The Way of the Exploding Fist, developed by Beam Software, published by Melbourne House in 1985. Visuals are today taken for granted in a world controlled via graphic user interfaces. Our minds are accustomed to images materialising on screens. When such magic was yet unseen and unthinkable, programmers had to find a way to make just a single dot appear. Once successful, early proofs of concept attracted the attention of artists. Developers also started courting designers to put into pixels what looked so grand on paper. A symbiosis was thus created in which programmers would gradually empower artists to employ their abilities in the digital realm. The number of colours, the size of characters, the detail of animation or the variety of locations, to name but a few, each depended as well as impacted on programming skills. Programmers and graphic designers furthermore had to hone their skills on the Commodore 64 individually. An early loading picture from Ocean Software’s Roland’s Rat Race. Click to play You Tube video. Graphics artists were not to succumb to the rigid limitations of Commodore’s platform. Despite programmers’ efforts to lift restrictions from the designers’ shoulders with a line of code or two, water colour or oil painting and sketching techniques no longer applied to computer screens. Designers effectively had to unlearn their craft to comprehend not the limitations but to recognise the unique opportunity. In effect, computer graphics design was born alongside its programming sibling. The most crucial technique of C64 graphics design was colour palette augmentation. 16 colours seemed a luxury in 1982 when Commodore launched its flagship computer, but the significance was lost to artists accustomed to mixing their own palettes from an infinite number of colours. One solution was miraculously lifted from pencilling, the cross-hatching technique: A dark-coloured, chequered pattern was modeled pixel by pixel onto a lighter background. Due to the density of the pattern and the close proximity of light and dark colours, the illusion of a medium dark shade was achieved. Tutanchamun (1986) in 160×200 pixels, a perfect example of “pixel cross-hatching” on the Commodore 64. The legendary Bob Stevenson used this and other techniques to make the C64 appear to have a much greater color palette than the 16 colors it did. Another solution eventually attained world fame, anti-aliasing: If an angled black diagonal crosses a white background at the C64’s native resolution of 160×200 pixels, its very rough, jagged appearance can be nurtured into a much smoother – and thus more appealing – appearance through the application of one or two pixels of colours corresponding with the background at the jagged sections. This makes the black line blend into the stark background. Thirdly, lossy image transmission technology in television sets and computer screens made colours “bleed” into each other, causing the image to blur artificially. The odd placement of one colour next to another therefore effectively created a colour never intended to appear in a C64 programme. And now Sam Dyer has preserved this artistry in a book printed to absolute perfection. Anti-alias on the Commodore 64: Druid 2 – Enlightenment, released by Firebird in 1987, boasts a spectacular loading screen by Paul Docherty. The smart use of color on the druid’s sleeves, the gentle placement of a few green pixels next to the highlight on the ogre’s head and the smooth waves in the hero’s thick mane show how techniques such as anti-aliasing pushed the C64’s visual capabilities further than its engineers thought possible. Click for gamesradar’s full story on Commodore 64 loading screens. To print images measuring 160×200 pixels at 300 dots per inch must be madness. Sam Dyer did exactly that and thereby broke a mould that had lasted for more than thirty years. Since early games were of simple appearance, promotional materials relied on rich box art to lend these games scope and a sense of relatable urgency. Whether one considers Taito’s Space Invaders from 1979, 1985’s Commando by Capcom or Lucasfilm Games’s 1987 sensation Maniac Mansion, screenshots always constituted secondary information. Box artwork was specifically designed to manipulate potential buyers, who would then merge their visual memories of the package design with the often extra-abstract graphics of the actual game. 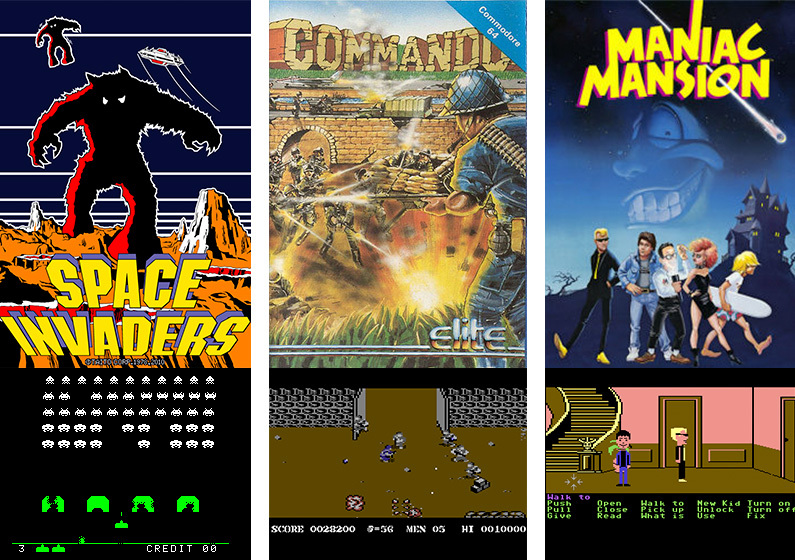 Space Invaders by Taito, Commando by Capcom, Maniac Mansion by Lucasfilm Games: These games were promoted using exciting, professional artwork that captured their spirit and scope in ways 8-bit visuals could not on their own. Sam Dyer has now broken this mould with the release of his Commodore 64: A Visual Commpendium to celebrate the artistry achieved on this legendary platform. Click to enlarge. Sam Dyer’s unique approach is ingenious. The removal of a work of art from the medium it was designed for, to put low resolution computer graphics to paper, rather than the sketches that preceded them, celebrates the hard work and the sterling achievement of these women and men who committed themselves to giving users the best looking entertainment possible, and proves a vital point. 8-bit computer graphics still hold their own as purposeful creations from a time marked by experiments, explorations of techniques and trailblazing concepts without which computer and video gaming as we know it would not exist. Now there is finally a way to savour this pioneering age and its digital crafts. In Commodore 64: A Visual Commpendium, readers will discover the beauty of an industry’s foundation. They will be drawn into mesmerising chunks of colour that, almost like a Rorschach test, come to life at first glance. The very elegantly layouted comments from members of the retrogaming community, effectively brief and striking, augment the visuals as voices from a by-gone era. As readers progress, they will come to connect with these echoes from around the world, regardless of their degree of familiarity with the subject matter. Commodore 64: A Visual Commpendium by Sam Dyer is a unique journey through the visual building blocks of the computer and video gaming industry, an affectionate appreciation of groundbreaking works of art that finally will see the light of broad public interest. Available now from www.funstock.co.uk.